We (Enstar LLC) have the account, and you are paying us. We use PayPal because they are a respected and reliable processor of credit card transactions, for American Express, Discover, Visa and MasterCard. They offer an efficient service with low charges, and that enables us to keep our prices as low as possible. We also use this third-party credit card processor for your protection. At no time does anyone in our organization know your credit card details. At the Shopping Cart click the 'Continue to Checkout' link. For all payment methods, American Express, Discover, Visa and MasterCard ...and PayPal. You are simply asked for your name, address and credit card details. Use the name and address of the registered credit card holder. You will be asked to create a password so you can track your transaction and your email address so you can be sent an email confirming your transaction. 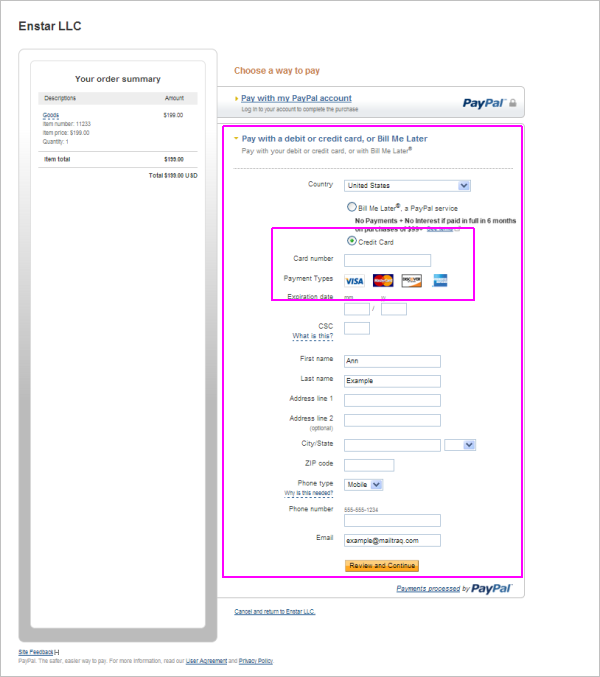 The Payment Details form looks like this example. 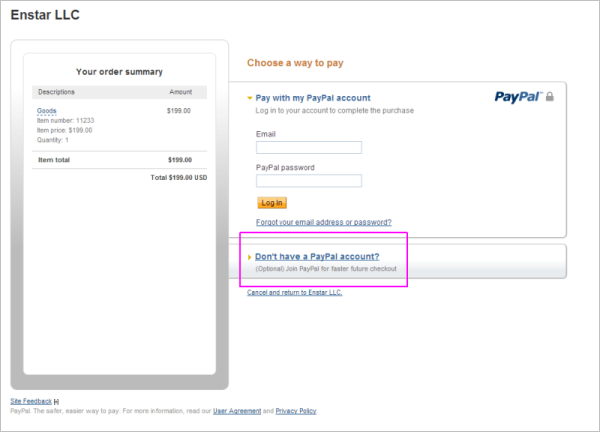 The PayPal Team will respond with a Confirmation screen. We will contact you to confirm that your license has been Authorized. License Authorization is a manual process, so it may be the next working day before we email you - but your Mailtraq will be working straightaway. You can read about how license activation works here.